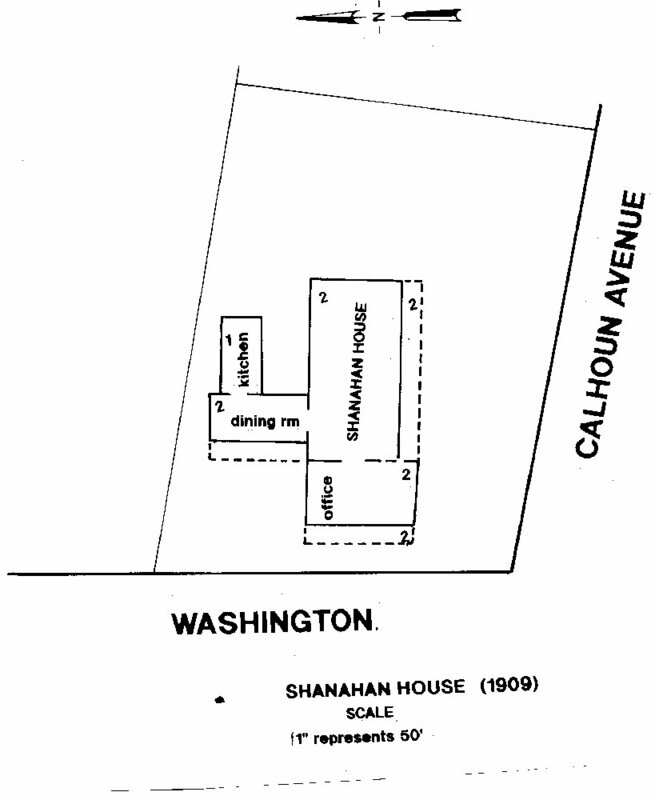 The Shanahan House was located on the northeast corner of Washington and Calhoun Avenue. It occupied Lot 12 in Block 4 of the Culmseig Map of Ocean Springs (1854). The Shanahan House was originally the home of John and Maria Shanahan. In April 1897, a second story was added and the structure was probably called the Shanahan House or Shanahan Hotel. At this time the building had a living area of 3360 square feet. By 1909, the building had been enlarged to 9706 square feet. This included the kitchen, dining room, and office. There was a small stable a few hundred feet east of the hotel. Here John Shanahan (1810-1892) built a home and made his livelihood as a carpenter. He reared a family with his wife, Maria Torney (1826-1909). The Shanahans had six children come into the world on Washington Avenue: Bridget Shanahan White (1860-1943), Mary E. Shanahan Ill (1863-1937), John J. Shanahan (1864-1883), Richard Shanahan (1866-1896), Sara T. Simmons (1869-1947) and Thomas B. Shanahan (1872-1932). After the death of John Shanahan in 1892, Mrs. Shanahan leased the Meyer Hotel (originally the VanCleave Hotel) near the L&N Depot for a brief period in early 1893. Shortly thereafter she probably began accepting boarders at her Washington Avenue home. It was reported in The Pascagoula Democrat-Star in October 1895 that "the Shanahan House was painted a dark brown color." "The guests of the Shanahan House and a few invited friends enjoyed a picnic over at Deer Island Wednesday. The weather was ideal and a splendid time was had by all." "She was one of natures noblewomen. None ever entered her abode, be he a friend or a stranger within our gates, without a warm welcome, nor left without feeling the warmth of a genuine hospitality. Nor did age dimenish her unselfish solicitude for her friends and loved ones. Her whole life was a poem of devotion to her family and her duty." In addition to room and board, the Shanahan offered other services. Its large dining room was often utilized for parties and banquets. When the firemen of Ocean Springs celebrated the twenty-ninth anniversary of Ocean Springs Fire Company No. 1 on August 19, 1909, they celebrated after the two o'clock parade with a "big banquet at Hotel de Shannahan". Following the meal, the Ocean Springs Brass Band and the fire companies serenaded the business houses. After Mrs. Shanahan died in 1909, her son, Thomas B. Shanahan, a carpenter like his father, ran the hotel with his sister, Mary, and later Bridget White, their sister. Mary Shanahan married Frank Ill (1861-1937+) of Rock Island, Illinois at Gulfport in June 1916. Ill's parents were German. He had owned a hardware store at Ocean Springs in 1910. 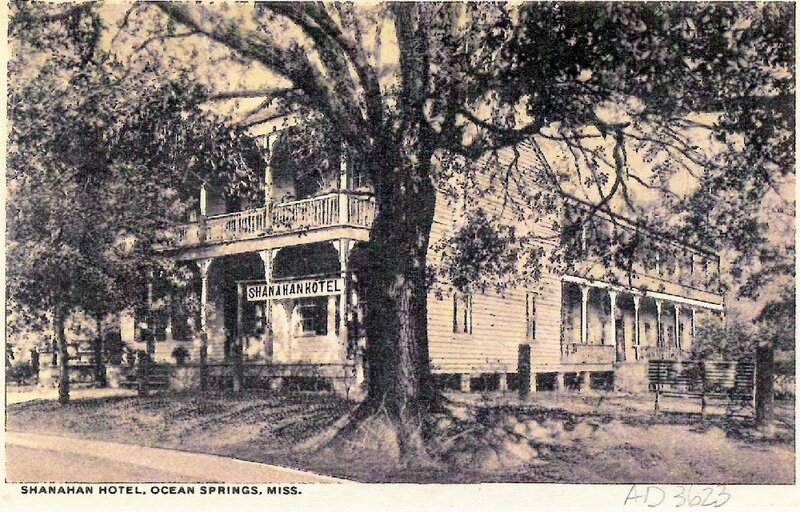 Mary Shanahan had operated the Iberville Hotel at Ocean Springs in 1905-1906. The Iberville was closed in March 1906, in order that she could concentrate her full energy in making the Shanahan House a first class establishment. Mary Shannahan Ill left Ocean Springs and went to Rock Island where she made a home for her family. She died and her remains were interred at Rock Island in June 1937. During the "Big Fire" of 1916, the Shanahan House caught fire in eight different places. Only the heroic efforts of firemen and volunteers saved the inn. On December 24, 1919, the Shanahan met its demise in a roaring conflagration. The fire was discovered in the attic at midday and consumed the structure within an hour. Sparks from a chimney were believed responsible for the disaster. Fortunately, most furniture and effects on the first floor and some things including guests' baggage on the second story were saved. The loss was estimated at between $12,000 and $15,000. Insurance coverage was for only $3500. The furniture was consigned to H.F. Russell (1858-1940) to sell. Mrs. B.E. White, the proprietress, moved to Natchez to live with her sons, Thomas White (b. 1884) and John White (b. 1887). Little Childrens Park is well utilized by the citizens of the city and is a welcome green space in this rapidly developing city. Jerome, Lepre, Catholic Church Records Diocese of Biloxi (1843-1900) - Volume I, "Shanahan", (Diocese of Biloxi: Biloxi, Mississippi-1991), pp. 315-316. Ocean Springs Business Directory (1893). The Biloxi Daily Herald, "Fireman's Day", August 20, 1909, p. 4. The Daily Herald, July 4, 1916, p. 3. The Jackson County Times, "Local News", December 27, 1919. The Jackson County Times, "Native of Ocean Springs Dies in Rock Island, Illinois", July 10, 1937, p. 3. The Pascagoula Democrat-Star, "Ocean Springs News", October 11, 1895. The Pascagoula Democrat-Star, "Ocean Springs News", April 23, 1897. The Pascagoula Democrat-Star, March 23, 1906, p. 3. The Pascagoula Democrat-Star, "Ocean Springs News", October 12, 1906. US Census - Jackson County, Mississippi-(1860, 1870, 1880, 1900, and 1910). Sanborn Map Company (New York), "Ocean Springs, Mississippi. ", (1909)-Sheet 1.